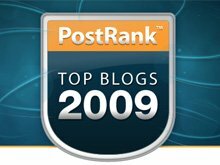 PostRank has announced its Top Blogs for 2009. Catalogued topics where awarded in three categories: Most Engagement, Most Influential, and Biggest Mover & Shaker. HDTV.Biz-News.com is a winner in the 2009 Category for “Mover & Shakers” and has ranked second in the “Most Engagement” Category for HDTV. We are honoured to receive such a PostRank award that evaluates the best blogs on the web. This award would not be possible without our unconditional followers who use HDTV.Biz-News.com as a news reference for the sector. This is a true reader’s choice award and we owe it to you! Thank you! We will keep bringing great news and hope for yet another successful year in 2010.